Iron Factory is one of the absolute best in the scene when it comes to small legends scale releases. They seem to churn out figures at a speed that rivals official product to boot! These guys are an awesome company to keep an eye on and as soon as I saw they were going to be working on a version of God Ginrai/Powermaster Optimus Prime I knew I had to try and get my hands on one. This is another figure coming to us thanks to my buddy Bryan L. He was kind enough to let me check out his copy of Ultimate Commander for this review and spoiler alert, I'm probably gonna be picking up one of my own. 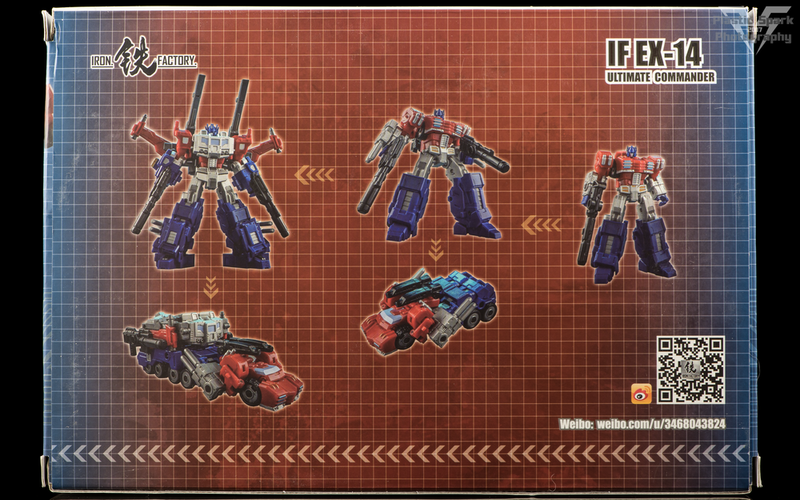 Iron Factory has put a bit of a twist on the classic scheme of “Optimus + Trailer armor” by using the War Within/Stormbringer design for the base figure instead of the classic square semi-truck. This gives the figure a nice Cybertronian vibe similar to Iron Factory’s other legends class figures. There is a bit of an unsightly gap right in the front of the vehicle but otherwise this alt mode is quite clean. ** Wrist mounted blasters from robot mode serve double duty as huge exhaust manifolds on the side of the vehicle and the whole rig looks very sturdy and well armored. All 6 wheels are real, and do roll when in contact with the table. **The gap is actually caused by a mistransformation on my part. The hood/chest area can actually tilt up to close up that gap and give the hood and fenders the same slant. My bad guys, sorry! 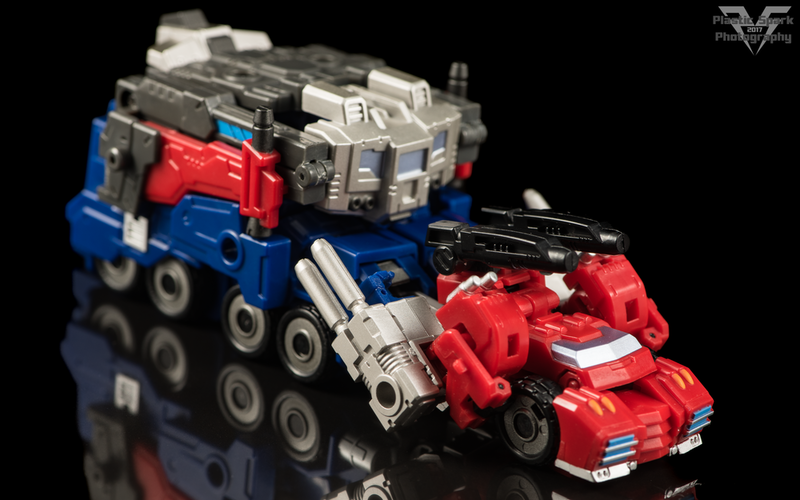 Now, that’s not all that you can do here in vehicle mode. The God Bomber style trailer can peg in very easily using the peg holes on either side of Commander’s legs and holds on very securely. The trailer adds 2 more functional wheels to either side and really completes the look. Despite the small size of this figure, once you have him armed up with all his included weapons he becomes and absolutely imposing looking fortress on wheels. Transformation to bot mode is simple and intuitive, with just enough “play” to the job to make it fun. The only part that can be slightly difficulty is pulling the head/chest out properly as the pieces are quite small. I was very impressed with the intricacy of the transformation, I think this is the first time I’ve ever seen a collapsing thigh/leg on a figure this small! Once Commander is transformed into his base robot mode you can see he is an exact, tiny replica of the Cybertronian Optimus Prime featured in the late Dreamwave and early IDW comics. He is absolutely covered with fantastic detail, and a ton of paint. There’s silver everywhere you look! The paint application is clean with no noticeable slop or overspray on this copy. The level of detail in the head sculpt and paint work is particularly impressive given the size of this figure. 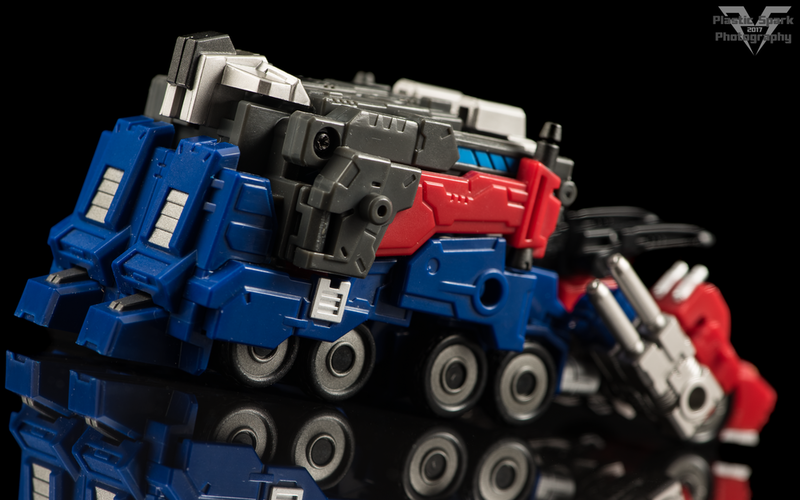 Commanders articulation is quite extensive for his size as we have come to expect from Iron Factory. The head is mounted on a ball joint with a decent range all around, He has very limited ball joints at the shoulder, mostly just allowing for front and back swing, as well as a bit of a butterfly joint if you cheat and use the transformation to your advantage. There’s a bicep swivel, 90 degrees at the elbow, and wrist swivels. He has a full waist swivel, ball jointed hips that are far more accessible than the shoulders, thigh swivel, 90 degrees at the knee, and a slight bit of ankle articulation. Now, there are certainly points that could use a bit more articulation, particularly the shoulders, but given the legends style size class we are looking at here the suite is still quite impressive. If I could be picky I’d have loved an ab crunch or maybe double knees/elbows but you don’t really need them. Armored mode is very fun to implement as the God Bomber trailer disassembles into its component pieces and clips onto the base figure in a fun and intuitive way. The new head and chest look great and the way Iron Factory used these pieces to enlarge the entire figure without affecting the proportions too severely is impressive. I particularly enjoy the wing pack and unfolding shoulder mounted rail cannons. Paint detail on the chest armor is very nice and the overall color layout remains appealing. Unfortunately this upgrade comes at the cost of some articulation. The shoulder armor severely limits the already limited shoulder movement and the same goes for the new pelvis/waist armor as it limits the hips severely as it does not have adjustable hip skirts like the base robot mode did. We also lose our wrist swivels due to the new gauntlets that peg into the existing hands. On the bright side however we do get an awesome improved ankle tilt with Commanders new boots! I love the way that the fully armored mode looks but the limitations imposed by the armor prevent you from achieving a lot of dynamic poses. This is fairly typical of these styles of characters however it is still a bit disappointing. As with many of Iron Factory’s releases Ultimate Commander comes with a small treasure trove of accessories. On top of the Apex Armor/God Bomber components he comes with a small twin cannon that can be mounted on his back in his base configuration for alt mode or vehicle mode, a blaster inspired by Optimus Primes trademark Ion Blaster, dual blaster rifles for armored mode similar to God Ginrais firearms, and lastly an energy axe and sword, which can both combine to become a large halberd for combined mode. The accessories are all a lot of fun and have great options for storage and function with Commander and other figures in this range. First run versions of Ultimate Commander also shipped with a bonus figure, IF-EX16A Alleria, a retool of their Pink Assassin figure with a new head to homage Elita-One. I reviewed that figure separately here. You can tell by looking at the side of the box if your Commander comes with Alleria so make sure to double check if you are after this bonus figure! 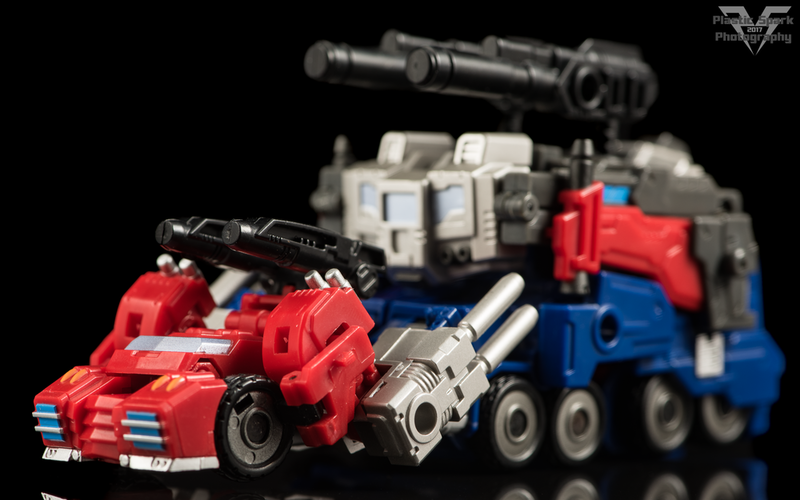 Iron Factory continues to pump out solid releases for legends scale collectors. Ultimate Commander is a fun package that does a lot right, with only a few minor missteps. Aesthetically I like what Iron Factory are doing by mixing various styles and source material to create this hybrid version of Optimus Prime/Ginrai. I’d have liked to see the armored mode resolve some of the articulation issues it creates but the overall functionality is still there. If you collect legends scale, or are particularly fond of Powermaster Prime/Ginrai then I can definitely recommend this figure to add to your collection. I think this guy would look excellent on the same shelf as a couple of those Hybrid Primes that Takara put out a few years ago! Thanks for checking out my review! Let me know what you think in the comments, and don't forget to check us out on Facebook! If you have a question or comment that requires a prompt response please don't hesitate to message me on Facebook or email me at plasticsparkphotography@gmail.com as it's much easier and quicker for me to respond than in the comment section here! Thanks for checking out the review and I'll see you guys soon with more!